This Mercury Dual Imaging System (MDIS) image-mosaic provides us with a truly detailed view of the Features and Structures associated with the beautiful (and extremely huge and unusually-looking) Peak-Ring Basin known as "Raditladi". Raditladi Basin (approx. 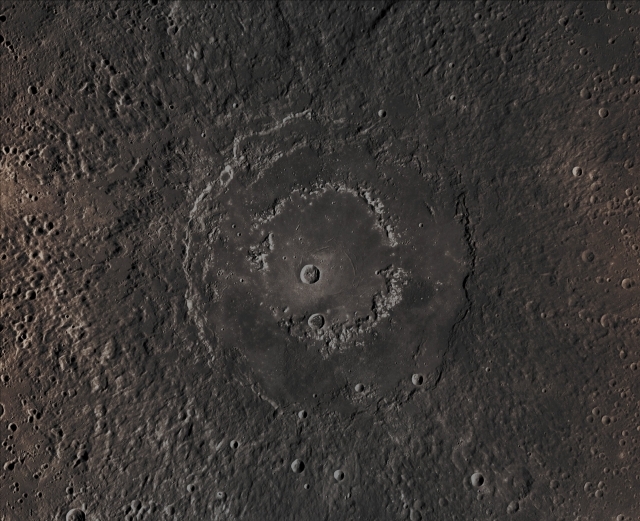 258 Km - such as about 160,218 miles - in diameter), first imaged during the NASA - MESSENGER Spacecraft's first Mercury Fly-By - and so named in April of the AD 2008 -, continues to be an intriguing Region of study, with its well-preserved Features, relatively young age, exterior Impact Melt Ponds, Hollows-covered Peak-Ring, and Concentric Troughs on its Floor. This picture (which is an Original NASA - MESSENGER Spacecraft's b/w and NON Map-Projected image-mosaic published on the NASA - Planetary Photojournal with the ID n. PIA 19409) has been additionally processed, contrast enhanced, Gamma corrected, magnified to aid the visibility of the details and then colorized in Absolute Natural Colors (such as the colors that a human eye would actually perceive if someone were onboard the NASA - MESSENGER Spacecraft and then looked outside, towards the Surface of Mercury), by using an original technique created - and, in time, dramatically improved - by the Lunar Explorer Italia Team. Different colors, as well as different shades of the same color, mean, among other things, the existence of different Elements (Minerals) present on the Surface of Mercury, each having a different Albedo (---> Reflectivity) and Chemical Composition.